Hi friends. Another week down – this week of Berlin marathon training was unique because I ran 4 of my 6 runs while on business travel in Chicago. This also coincided with both one of my busiest weeks of work AND my first week of speed work and tempo runs. I was pretty nervous about my ability to fit everything in but I’m happy to report, I got it done! I know first hand how hard it can be to get your workouts in when you are traveling. But planning ahead can help, and was my saving grace this past week! Tuesday: 12×400. Oh goodness, this was hard. Like, REALLY hard. Goal was between 1:56-2:03 for each 400. Here were my times: 1:48 / 1:56 / 2:01 / 1:58 / 1:58 / 2:05 / 1:54 / 1:52 / 1:56 / 2:04 / 1:55 / 2:12. So yeah. Not really consistent and totally missed it on that last repeat. But like I said, that was really hard and I definitely have some work to do getting my fitness back! Wednesday: Rest day. SO NECESSARY! Thursday: First tempo workout of this cycle. 5 miles at tempo (goal is 8:58) plus a warm up and cool down mile. Tempo miles: 8:48 / 8:41 / 8:41 / 8:49 / 8:28. I always start a training cycle running my tempo miles a bit too fast. I know these tempos will settle in over the course of training. Friday: Easy 4.2 – last run in Chicago before heading back home. Saturday: I had to work the water stop for my Saturday group. So I ran 1.5 before and 3.1 afterwards for just shy of 5 for the day. It was HOT and humid. GROSS! Sunday: Ran a small local ten miler to get my miles in for the day. It was ridiculously hot and humid and the focus quickly became survival. This was a tough tough race and I was SO glad when it was over! When was the last time you went from great to miserable temperatures all in the same week? The weather was so great in Chicago!! Great job on getting in your runs during travel! The humidity this weekend was super gross – I would love just one weekend that was humidity free, lol. OMG YES! It was soon bad! Great job getting all of your workouts in while you were in Chicago! It looks like you had a great week there. I feel like Pgh goes from great to terrible weather all the time. It makes it very difficult to acclimate to the heat but you just have to take it as it comes and do the best you can for that individual run. Yes – I so agree about how it’s really hard to acclimate with the constantly changing weather! Great job with all of your workouts this week. 12x400s are tough! I remember struggling through that workout. Yes – it is just SOOOO many! Yep, who would have thought Chicago would have such great weather? This summer has been fantastic. Do you think it will hold out for RnR in 2 weeks? So proud of you for getting strong mileage and workouts in while on the road because that can be HARD! Beautiful weather does help though- I would love some non-humid days or at least lower humidity. Right now anything below 95% feels good here which is kinda sad but that’s just SC for ya. It sounds like you had some tough runs with the 400s and the tempo, but you have a long time to go until the marathon at least, and speed workouts can be really hard to pace. Glad you found a race for your long run (you can’t beat getting a medal for a long run, hehe). Hope you’re getting some R&R back in DC and good luck this week! Thanks, lady! The lower humidity was SUCH a relief. Actually, I ran later this morning (like 8:45) and while it was hotter, the humidity had burned off some and that was MUCH much better. Have a great week! Wow, amazing effort! Good luck in Berlin! 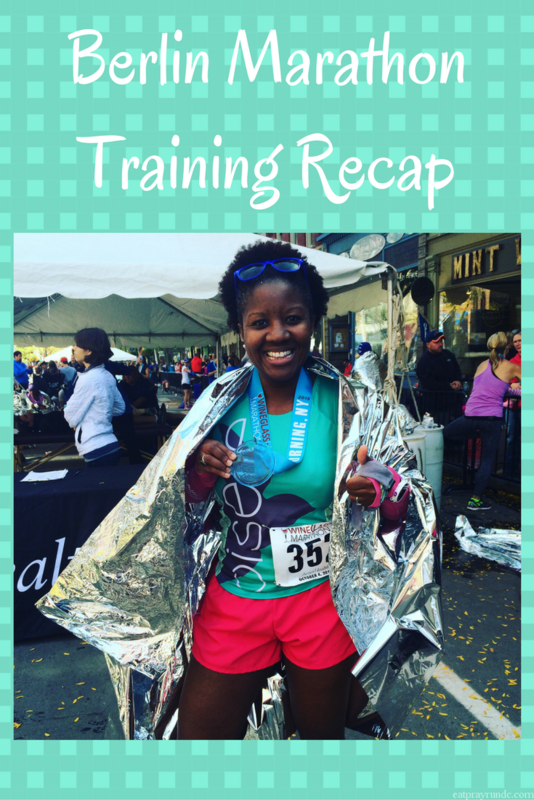 SO impressed that you nailed your training while traveling! I had no doubt that you would, but I’m still in awe. I’m glad you were able to plan ahead – that really is key, even at home. I dropped the ball on that this week and it showed in my training. 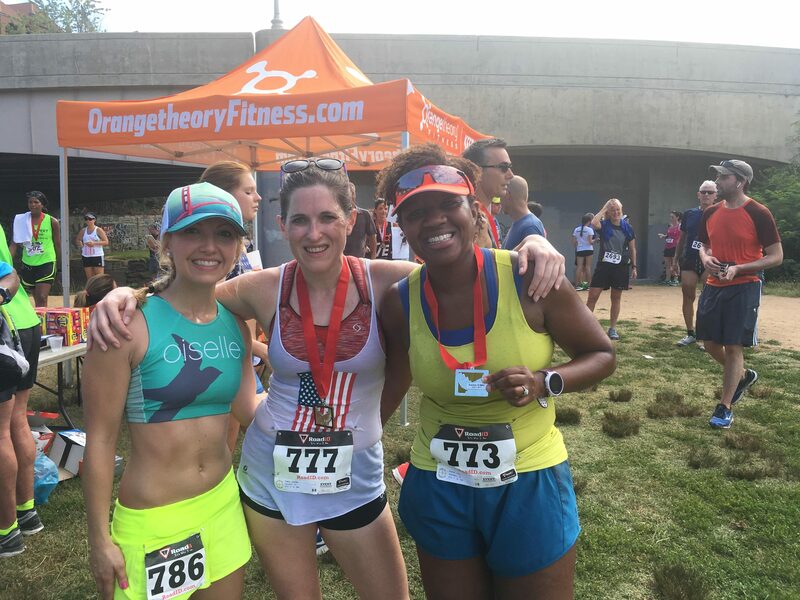 I loved the little comment you made about knowing your tempo pace will settle in as you go because it really speaks to your experience with training! I know that this time around I’m feeling a nice comfortability in knowing that I’ve done this training before and know what to expect and know how to judge my workouts and my progress. It sounds like you’re feeling some of that too. Congrats on another great week down! Thanks Tracy – looking forward to heading over and reading your recap momentarily. Also – can we run + get into water one weekend? LOL. Yes girl, you know I’m always down for that! Congrats on a great week of training! 400 repeats are tough no matter where in your training cycle you are. Temperatures are ridiculous here right now. During the week I get my runs in super early because of work, so the temps are good. On weekends when I like to sleep in a bit, I deal with higher temps–but sleep is important! Way to get your workouts in while travelling! Sounds like a fantastic week of training. 12x400s sounds tough! Glad you found a track for that speedwork! I haven’t done a track workout in eons, but I start a new plan next week. Repeats are tough, but feel so great after. Happy 4th! I wore a longsleeve at the beginning of last week because it was so wonderfully cool…and then it went downhill from there! The 12X400 workout is my least favorite workout of Hansons. Maybe it always feels so hard because it’s the first workout? Still, you got it done, and that’s something to celebrate! Great job on getting those runs in! I too, was out of town, and had to fit those workouts in the schedule, lol!